Tai Chi Class – Wednesday lunchtime 12-1pm. Westfield Sports Centre Eckington Road Sothal Sheffield S20 1HQ. 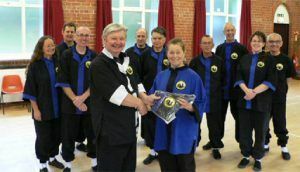 Chief Instructor Howard Gibbon presenting Margaret with her Master Grade Tai Chi Award which she gained in July 2013.